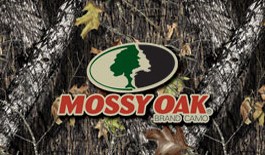 For over 20 years Mossy Oak has offered some of the most innovative camouflage patterns available. Today their patterns embody the lifestyle of hunters and outdoor enthusiasts alike. Visit our collection of Mossy Oak rear window graphics and bring this pattern to life on the back of your vehicle. If you are interested in creating your own custom rear window graphics using Mossy Oak camouflage, give us a call. Our Mossy Oak's rear window graphics have been officially licensed by Mossy Oak.